A large yet inexpensive aviary or a fully enclosed outdoor animal pen! - Frame Made in USA! - Shipped direct from Sunrise Domes! Portable – easily disassembled so you can take it with you when you move! Versatile – can easily be converted into a greenhouse, pool/Jacuzzi/koi pond cover, car or tractor storage, garden trellis, etc. 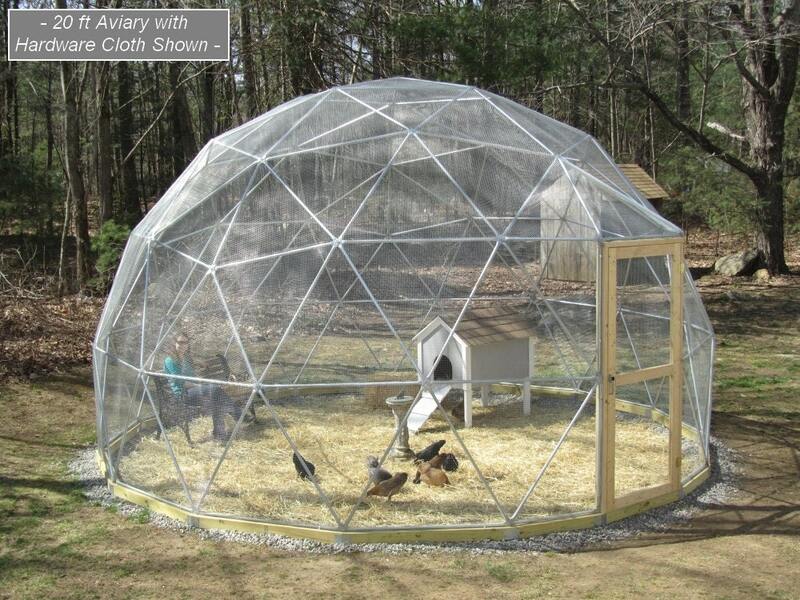 This listing is for a 20 foot diameter geodesic dome aviary. The dome is 11 feet 8.6 inches high in the center and features 297 square feet of floor space. The doorway dimensions are 6 feet 10.4 inches (82.4 inches) x 3 feet 11 inches (47 inches). The approximate dome kit weight is 400 lbs. The foundation ring plans provide step-by-step instruction to create and assemble a ring of wooden 4x4s. The customer supplied materials are available at most home improvement stores. This provides an excellent means to produce a flat and level surface for the dome as well as to prevent direct contact between the frame and the soil. The foundation ring will add 3.5" of extra height to the aviary. Other sizes are available - contact us for more information. As each order is custom, please allow two to three weeks manufacturing time. - AK, HI, PR and International bidders please contact us for a shipping quote. - Upgrade to PVC plastic coated wire mesh covering – options include ½ inch square hole in 19 gauge, 1 inch chicken wire in 19 gauge, 1 inch square hole in 16 or 14 gauge, 1.5 inch by 4 inch in 12.5 gauge, and 2 inch by 4 inch in 11 gauge (wire thickness increases as the gauge number decreases) – please contact us for pricing. Please allow three to four weeks manufacturing time for wire mesh upgrades. - Frames for endless uses!
. . . check out our other Etsy listings! Geodesic domes use 25% less materials to enclose a given space as compared to conventional rectangular designs. The lightweight and relatively short length of each frame strut allows any dome kit to be divided up into bundles of manageable weight. Geodesic domes gain great strength by distributing loading through all structural members. Their rounded shape naturally deflects wind and sheds snow accumulation. Any geodesic dome kit can have many uses and may be easily converted into a structure that suits a different application (e.g., a storage building during the winter and pool cover during the summer). When the boxes came in, I admit, it looked a little intimidating! The instructions were color coded along with the parts which made assembly a breeze! My husband had it together in about 2 hours. All parts were there and construction is sturdy. It's perfect. Very well made kit. I love this thing. It is the basis for a radionic sculpture I am making. Friendly, professional, quick responses, amazing product built to order. Payment can be made through Etsy via PAYPAL. If any aspect of your order is damaged or missing upon delivery, contact us through Etsy immediately for replacement. If you are not completely satisfied with your purchase, please contact us within 30 days from the date you received your order and we will happily refund the purchase price of your item(s) less a 25% restocking fee. Shipping charges are not refundable. Any returned item with free shipping will be charged the original shipping and handling costs incurred by us. Any discounts given will be subtracted from returned merchandise refunds. Customers are responsible for the shipping costs involved with the return of an item. Returned products must be in original condition (this means clean and dry with original packaging material, manuals, plus all other accessories provided by the manufacturer). Returned items not in original condition will be assessed and charged an additional reconditioning fee, or refused. Any order involving custom work is not returnable. Orders cancelled more than 5 days after they were placed may incur up to a 20% fee to compensate for labor and materials invested in the product. Every order is custom so please see each listing for specific manufacture estimates. We ship ground UPS and provide tracking numbers for your convenience.